Rice isn't just a side dish anymore. The versatile grain is finding its way into more and more processed foods. And now, the trend is getting a boost from the innovations of two Agricultural Research Service scientists in New Orleans, Louisiana. On one front, ARS food technologist Ranjit S. Kadan has cooked up a new kind of french fry that could appeal to health-conscious consumers who simply can't resist this fast-food favorite. Rather than potatoes, Kadan's fries are made from mixtures of rice flour. 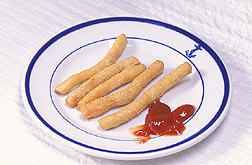 And when plunged into hot oil, he says, the rice fries absorb far less fat than regular potato fries. Harmeet S. Guraya, meanwhile, has devised a method for shaving the cooking time of raw brown and wild rices from 45 minutes to about 15. Although the nutty-flavored brands are highly nutritious, one of the main reasons today's busy consumers don't want to eat them is because of the long cooking time, says Guraya, also a food technologist. Like Kadan and other scientists assigned to ARS' Food Processing and Sensory Quality Research Unit (FPSQ) in New Orleans, Guraya's hope is to pass his innovations along to a commercial partner for development into a product that will benefit the industry and consumers. According to the USA Rice Federation, the United States is currently the world's third largest exporter of milled rice. At the same time, the nation's per capita consumption of rice is at an all-time high of 27 pounds annually. Much of this can be attributed to the increasing use of rice and rice ingredients in processed foods, a market outlet that includes snacks, soups, frozen dinners, candy, sauce thickeners, pasta, and other products. test on long-grain brown rice. 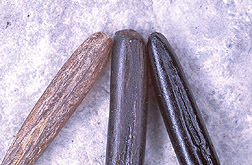 (K9625-1) Despite this success and a reputation for nutritional excellence, the grain's full potential has yet to be tapped—especially in regard to using its flour, starch, protein, bran, hull, and oil. That's where the scientific talents of Kadan, Guraya, and other FPSQ rice researchers come into play. Their charge is to invent, design, and demonstrate novel methods of processing rice and its constituents into new, value-added products, says Elaine T. Champagne, FPSQ research leader. Kadan, for example, has set his sights on making french fries from the flour of broken and immature or thin rice kernels. "When you mill rice, you have about 15 percent that are broken or immature," says Kadan. "These sell for slightly less than whole rice." Aside from aesthetics, he adds, there's nothing wrong with broken rice, which is usually destined for making beer, flour, and pet food. Scientists before Kadan first tried making french fries from rice flour in the 1970s. But their efforts were sidelined because of technical hurdles. "One of the main problems was how to add more water to rice flour during processing without making it too soggy," Kadan says. In 1999, he overcame the problem with a novel rice flour processing method that USDA filed a patent on in August 2000. The key to Kadan's approach involves processing mixtures of flour from different rice varieties into a dough that can be extruded into a french fry shape, precooked in hot oil, and then stored in a freezer until use. Just as important were Kadan's studies delving into the effects of amylose and protein in short-, medium-, and long-grain rices. This enabled him to refine the properties of rice fries so they more closely mimic those of potato fries. Depending on the flour mixture, the rice fries in tests absorbed 25 to 50 percent less fat from oil during cooking than potato fries, says Kadan, whose research was published last year in the Journal of Food Science. Kadan envisions rice fries that can be easily fortified with vitamins, minerals, soy or rice protein concentrate, and other nutrients. The fries would also benefit from other desirable rice characteristics, such as excellent storage, easy digestibility, mild flavor, and hypoallergenicity. Along with Rischellco, Inc., of Crowley, Louisiana, Kadan is consulting rice-processing experts on ways to commercialize the rice fries. In other work, he has begun experimenting with whole-rice bread for individuals with celiac disease, an intolerance to wheat gluten that affects 1 to 2 percent of the U.S. population. "These consumers cannot eat any wheat—not even traces of it—because of the protein gluten, which gives bread its elasticity and viscosity," he says. "The rice bread I'm working on wouldn't have any gluten in it." Guraya has a different agenda. He is seeking a commercial partner to help scale up a mechanized process he devised for cutting the cooking times of raw wild and brown rices, which usually haven't been precooked and are packaged with their bran intact. "These grains, as well as edible seed crops such as beans, require long cooking times largely because of their slow rate of hydration," or water uptake, Guraya says. In general, these rices take up to 50 minutes of cooking to become soft enough to eat. This is mainly because waxy layers in the bran keep water from penetrating the grain. Instant rice products cook faster because they are first soaked in water while raw, then cooked or steamed before a final drying step—a costly process. "Many people are used to eating instant rice brands, but others prefer their rice fresh," says Guraya. So about a year ago, he struck on the idea of "sandblasting" the rice grains—using rice flour instead of sand and a conveyor-belt-like setup for transporting the grain. "The flourblasting technique is very simple, but it works quite well," says Guraya. 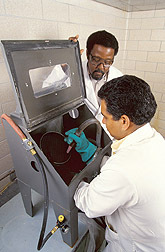 Using 60 to 70 pounds of air pressure per square inch, the blaster riddles the rice with tiny, water-absorbing holes so that it cooks 66 percent faster than it normally would. "The holes, nicks, and cuts formed on the bran aren't visible to the naked eye and therefore maintain the aesthetic value of the original product," says Guraya. "The same concept could also be used with other edible seed crops with long cooking times, such as corn, wheat, oats, and beans." In addition to improving rice's consumer appeal, Guraya is seeking to exploit the starch and protein found in the grain's bran. Currently, sodium hydroxide is used to break down starch and protein particles and extract them from the bran. 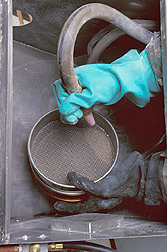 But the process is costly and can generate salt and other undesirable byproducts. Sodium hydroxide can also change rice protein's nutritional properties, Guraya says. As an alternative, he developed a process using high-pressure homogenization, which breaks down the starch-protein agglomerates and separates them without changing their nutritional properties. A cooperative research and development partner, Sage Five Foods of Los Angeles, California, has applied for a license on the technique. There are myriad uses for rice protein and starch. They include pasta, baby foods, sauce thickeners, and sprays for ironing clothes. "America imports most of its rice starch from Belgium. But if this technology pans out, it could cut down on such imports and make better use of our domestic rice crop," says Guraya. "And that makes economic sense. "—By Jan Suszkiw, Agricultural Research Service Information Staff. 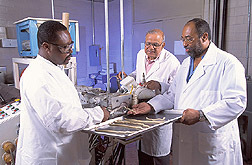 This research is part of Quality and Utilization of Agricultural Products, an ARS National Program (#306) described on the World Wide Web at http://www.nps.ars.usda.gov. To reach scientists featured in this story, contact Jan Suszkiw, USDA-ARS Information Staff, 5601 Sunnyside Ave., Beltsville, MD 20705; phone (301) 504-1630, fax (301) 504-1641. "Rice, Oh So Nice" was published in the May 2002 issue of Agricultural Research magazine.